Ivanhoe Forge Limited is one of the most established sub-contractors in the steel fabrication industry in North East England, specialising in structural/secondary steelwork, staircases, balustrading and metalwork. 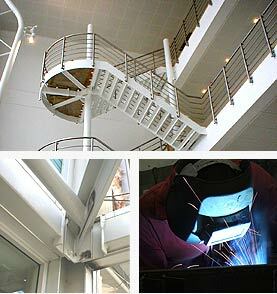 We are able to offer a complete package of design, detailing, fabrication and erection/installation, including structural steelwork, utility and feature staircases and balustrades in mild and stainless steel, as well as on-site and off-site fabrication and welding. If you have any queries about what we do, please don't hesitate to get in touch, and we'll be happy to answer any questions or provide quotations for you.